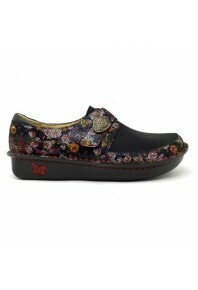 Alegria means "happiness".. it is also a line of fun comfort footwear from California company PG light. Developed with features that promote health and well being, ergonomic construction, heavily padded innersoles that make you feel like walking on the clouds. 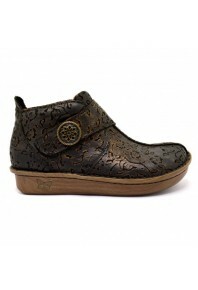 made with all leather uppers in a variety of styles and bright upbeat patterns. 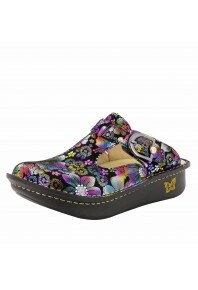 they will add colour therapy to your day and the rocker bottom will add spring to your step. 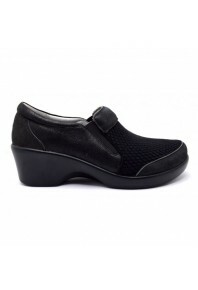 Versatile slide on sandal complimented with two buckle ornamentaion featured in a rich leather. ..